Turning west, the zimnik led us back towards evergreens and low hills. The sun shone brilliantly, casting deep shadows across our path through the woods. 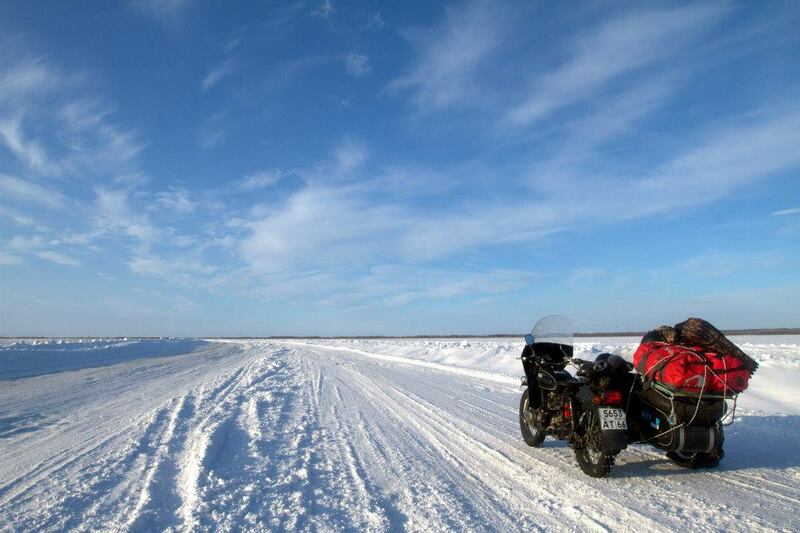 As intimidating as the ice road sounded, it was far easier than what we had faced in the first few days. As I drove along, Rico’s advice maundered through my head, “Keep very steady on the throttle, find the sweet spot and only move it forward or back a couple of millimeters. Like Olly said, make love to your bike.” I stroked her and caressed her, and, despite one pirouette, Eva responded in kind. At a T-junction we followed the sign, and Sergei’s map, and turned left towards petrol and lunch. The little town of Igrim has tidy streets, modern apartments, and well mannered children. 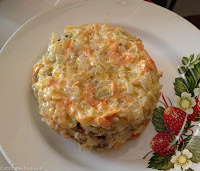 A gentleman we met at the gas station led us to a cafeteria where we wolfed down borscht, olivje (traditional Russian salad with peas and beetroot) and a kind of shuba (a ‘fur coat’ salad with carrots and onions, and in this case not herring, but mystery meat). Both the latter dishes were rich with mayonnaise, which, along with sour cream, is a staple ingredient of Russian cuisine. The restaurant’s manager, like many other Russian women my age, was built like a life-sized babushka doll. And like others I had met, she chastised me for buggering about on a motorcycle in the dead of winter and not being at home with my grandchildren. I appreciated her bemused attention. On the northern end of town the zimnik sat at the bottom of a high, steep riverbank. We followed a friendly taxi driver cautiously through the backstreets until we started downhill. Suddenly Nick flew past us, feet out like Fred Flintstone, trying to slow down La Poderosa before the intersection. Sweeping through the corner, the lack of traffic was probably the only thing that saved his and Paddy’s lives. Despite myself I couldn’t help but laugh in sympathy.